Deep and comprehensive free trade area (DCFTA) between the EU and Ukraine, which enters into force on 1 January 2016, gives Ukraine a lot of possibilities. But, on the other hand, it requires the country to fulfill rules and to be competitive. 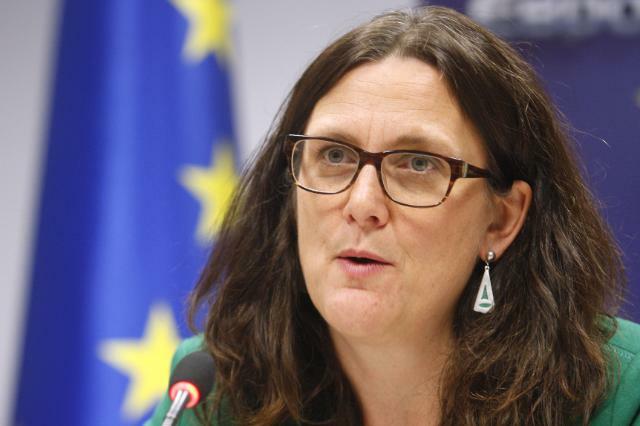 This was stated by Cecilia Malmström, the EU Commissioner for Trade, at the press conference in EU Delegation on November,13. I am visiting Ukraine in a timely moment – just 2 month before the association agreement’s trade part, on DCFTA, enters into force. And I am here today to discuss the preparations, the remaining reforms and the ongoing work. Today is very important moment to see where Ukraine is in its preparations, congratulating also the government and Ukraine for the reforms taken so far. And everything related to the fight against corruption is key in this regard. One particular reform is very important – to make sure that sanitarian and health requirements in agricultural sector come up to the European level. That would facilitate enormously the export of your very good products to Europe. And we are happy to assist with our expertise and helping to set standards, especially in the agricultural sector, so that they will be compliant with the EU norms. If the reforms in Ukraine are implemented and you move on to create a better business climate here – anti-corruption, with strengthened rule of law – it will also increase investments in Ukraine. And that will give more jobs, more growth, etc. This is an important work that has to be done by the government and the parliament. We will keep on supporting Ukraine on the road to reform. It is very important to take full benefits of the deep and comprehensive free trade area. Because DCFTA is an important tool. But it will not solve the problems automatically. That is why the reforms need to create the successful and good business and investment climate. DCFTA is not a magic, it is possibility. It gives Ukrainian companies an access to the EU market, but to this end they should fulfill rules and be competitive. One of the problems now in this regard is sanitarian checks. There are also other qualifications that need to be addressed. On the other hand, a lot of possibilities are opening up with the entering into force of DCFTA. And we are looking forward from the European Union’s side to work very closely with our Ukrainian friends to make the best possible out of this agreement and of the opportunities it creates for the increased business and trade co-operation between us. That will also facilitate exports not only to the EU, but also to other parts of the world. It is also important that once the DCFTA is implemented, the business is already aware of the possibilities of this agreement. And for that sake we have launched the e-book, the manual, to give Ukrainian business help and advice how to export to the EU in a best way. 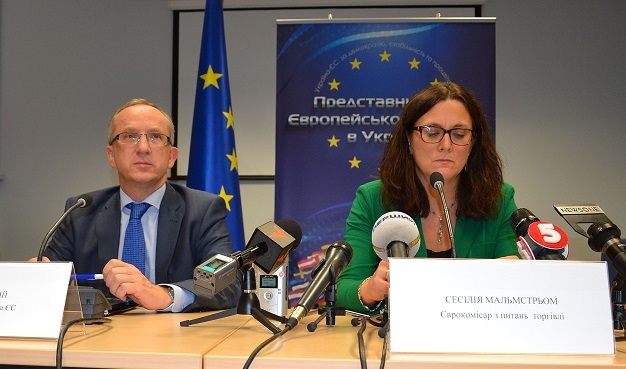 Cecilia Malmström, the EU Commissioner for Trade, visited Ukraine on 12-13 November. During her visit, she met President of Ukraine Petro Poroshenko, Prime Minister Arseniy Yatsenyuk, Minister of Economic Development and Trade Aivaras Abromavičius, Deputy Minister of Economic Development and Trade Representative Natalia Mykolska, Minister of Agrarian Policy and Food Oleksiy Pavlenko and had a working lunch with Minister of Foreign Affairs Pavlo Klimkin.